McNairn Packaging offers a superior product that is perfect for the needs of retail butchers, supermarkets, caterers, commercial processors and packers. 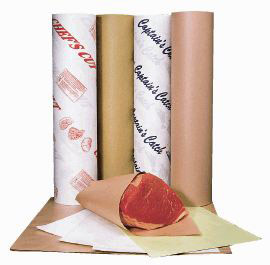 MeatGuard® freezer paper is enhanced with a special polyethylene coating so your product’s natural moisture and juices are locked in and air is locked out. Available in a variety of sizes and papers, with or without stock printed designs. Custom printing is also available.